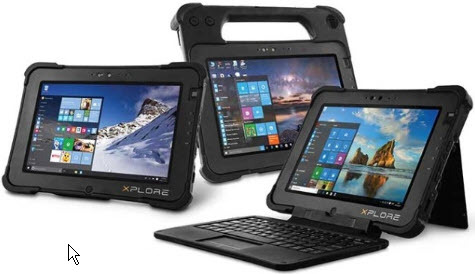 The Xplore L10 rugged platform offers a variety of tablet configurations and a shared accessory ecosystem. Each custom-configurable XPAD L10, XSLATE L10, and XBOOK L10 tablet offers industry-leading computing performance and fully rugged mobility. All L10 rugged tablet configurations share the same accessory set. Even when inventory managers are using the XSLATE L10, supervisors are using the 2-in-1 XBOOK L10, and field technicians are equipped with the XPAD L10 with the hard handle: All will be able to plug into the same office, industrial, and vehicle docks, use the same batteries and chargers, and share other accessories that support their business applications. Whether you opt for a high-speed 8th generation Intel® Core™-Series processor or more economical Intel Pentium® processor, your XSLATE L10 will deliver more than enough computing power. The optional 4G LTE card will give you an even greater boost if you need it, providing download speeds up to 600 Mbs and upload speeds up to 150 Mbs. This tablet will stay powered for up to 27 hours when you add the hot-swappable extended battery. Each of the three 10.1” WUXGA 2k resolution display options comes standard with Gorilla Glass and auto-sensing glove / wet touch technology that supports uninterrupted productivity in any work environment, even direct sunlight and rainy conditions. The high performance active View Anywhere™ 1000nit display adds advanced pen capabilities in addition to 10 point touch capability.